UCSC community members stand near the entrance at Kerr Hall to protest UCSC’s contract with company Bright Horizons and child care privatization. Photo by Lluvia Moreno. UC Santa Cruz student Alyssa Tamboura stood with her 8 year-old son at the UC Regents meeting Wednesday. The pair traveled over 300 miles to deliver a two minute message. During a rally in Quarry Plaza, two organizers read the statement they planned to deliver to Kerr Hall. It was also sent to Sue Matthews. Photo by Lluvia Moreno. 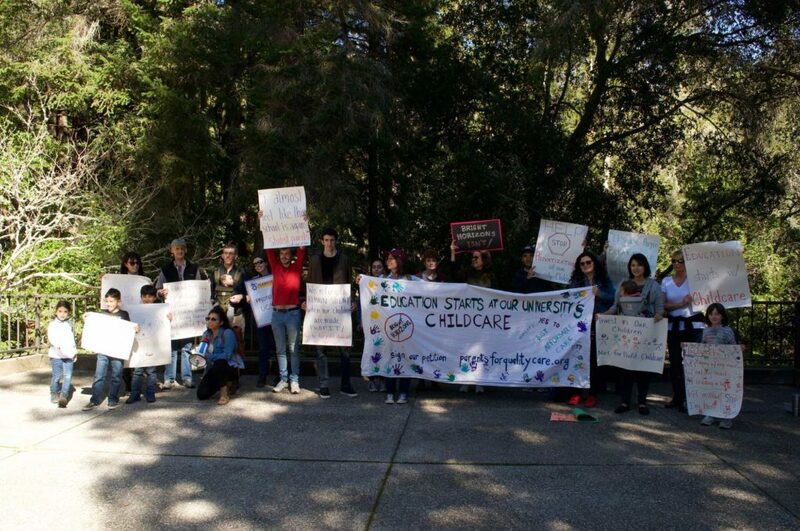 Two days earlier, more than 40 UCSC students, faculty and alumni marched from Quarry Plaza to Kerr Hall in an effort to halt the campus’ contract with Bright Horizons and the administration’s child care privatization efforts. Nonetheless, the regents voted to move ahead with the plan. Bright Horizons Family Solutions, a worldwide child care and education company, will work with Capstone Development Partners to oversee the design and implementation of the Student Housing West (SHW ) child care center and services. But some student-parents and other campus affiliates feel the for-profit company is unfit to serve the community and parents. UCSC’s contract with Bright Horizons will design a new child care center in conjunction with SHW contractor Capstone Development Partners. It will serve up to 140 children, according to the campus, and extend child care services to faculty and staff. The contract will also shift the responsibility of hiring to Bright Horizons, meaning UCSC will no longer select teachers and staff. In 2015, the university signed a five- year contract with the company that will begin once child care center operations commence in an anticipated date of May 2020. UCSC will proceed with child care privatization plans with the company after the UC regents’ Wednesday approval of the project. The SHW decision will not be finalized until a thorough financial analysis is completed by regents Hadi Makarechian, Lark Park and George Keiffer. Student-parents like Alyssa Tamboura and Yvonne Sherwood are satisfied with the child care currently provided by UCSC and worry switching to a private- run option will be detrimental to their children’s growth and education. Unlike Brighter Horizons, UCSC’s Early Education Services (EES) operates under Title 5 of California’s education code, which places operators under stricter guidelines for teaching and offers subsidies to lower child care costs for families. Critics of privatization argue Brighter Horizons adheres to lower staff qualification standards and sets greater adult- child ratios than Title 5. Depending on the service and the child’s age, day care ranges from $200 to $890 per month under the current UCSC-directed Early Education Services (EES) program. With pricing that will match market rates, Bright Horizons will charge more, according to the Graduate Student Association (GSA), which organized the march. 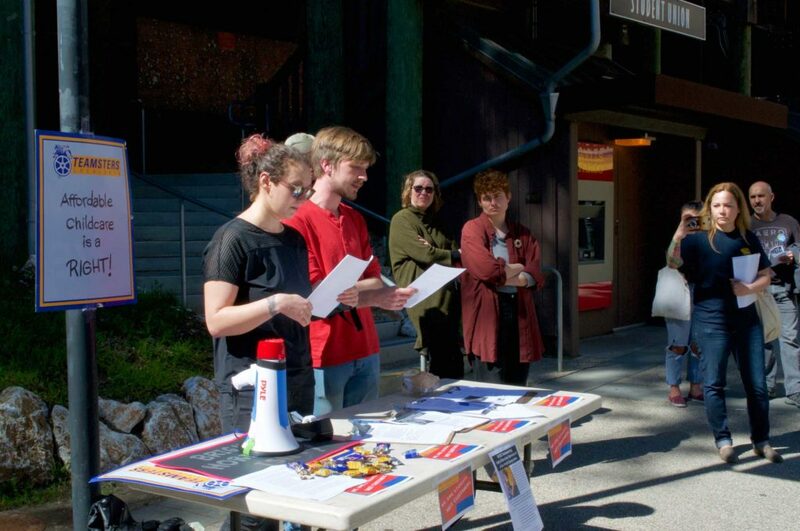 Despite more than 300 signatures on a petition opposing privatization, Associate Vice Chancellor of Colleges, Housing and Educational Services (CHES) Sue Matthews remains in support of the Bright Horizons partnership and is confident the contract will serve the needs of UCSC families. “We continue to believe Bright Horizons will provide our campus — the faculty, staff, and students — with quality child care, based on its performance at several other University of California campuses,” Matthews wrote in the statement. In the past, institutions like Cornell University and UC Berkeley criticized Bright Horizons for low-quality care and other issues. In 2010, Cornell University’s faculty senate recommended the termination of the university’s contract with Bright Horizons, citing high annual turnover in teaching staff and the company’s accumulation of 56 regulatory violations among other reasons, according to The Cornell Daily Sun. Citing these transgressions, critics at UC Berkeley halted privatization efforts after campus administrators announced contract plans in 2012. In front of the Kerr Hall main entrance Monday, graduate student-parent Yvonne Sherwood voiced her concern about the contract’s impact on the campuscommunity.